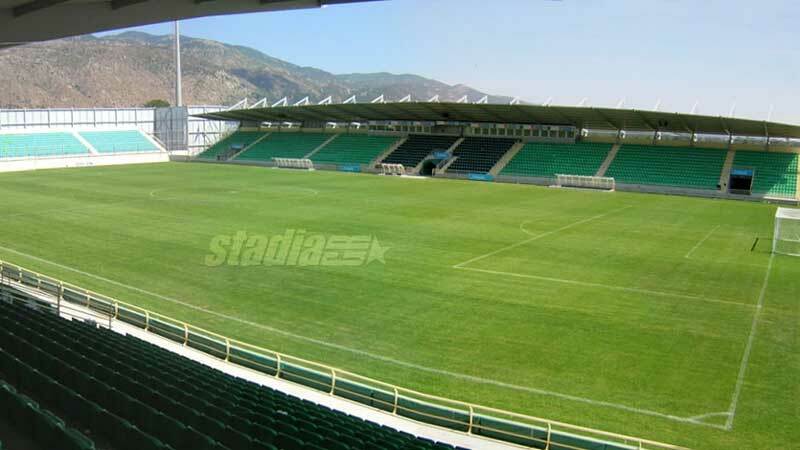 The Skoda Xanthi Arena or Pigadia Stadium is a purpose built football ground located in the north-east city of Xanthi. Constructed in 2004 over a 10 month period, the stadium is home to Skoda Xanthi F.C who routinely feature in the Greek Superleague and it currently has a capacity of 7,422. Skoda Xanthi Arena first opened on 30th May 2004 after a construction period of around ten months dating back towards the end of 2003. 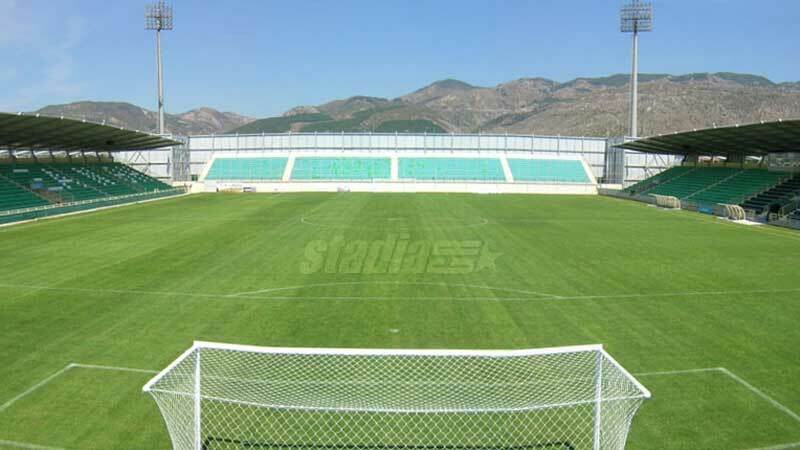 Known as Pigadia Stadium which is a name inherited from the village and training complex it is situated within, the new ground was built as the result of a disagreement between FC Skoda Xanthi, the professional team and Skoda Xanthi, the amateur club. Although Xanthi Arena opened in time for the 2004 Summer Olympics which were hosted by Athens, the €6.5 million euros stadium was constructed independently. Consisting of three stands in total, capable of accommodating 7,422 supporters, the stadium was originally going to be four sided with a capacity of 9,000, however the southern goal-end stand failed to materialise. To date the record attendance Skoda Xanthi Arena is 6,410 which was achieved with a game against PAOK FC on the 28th August 2005 right at the start of the Greek Superleague Season. Skoda Xanthi’s average attendance since moving to the Arena is around 1,500 per match, and based on these numbers its easy to see why there hasn’t been a rush to complete the stadium. The highest level of football played at the new stadium has undoubtedly been matches of the UEFA Cup, and more recently the Europa League. 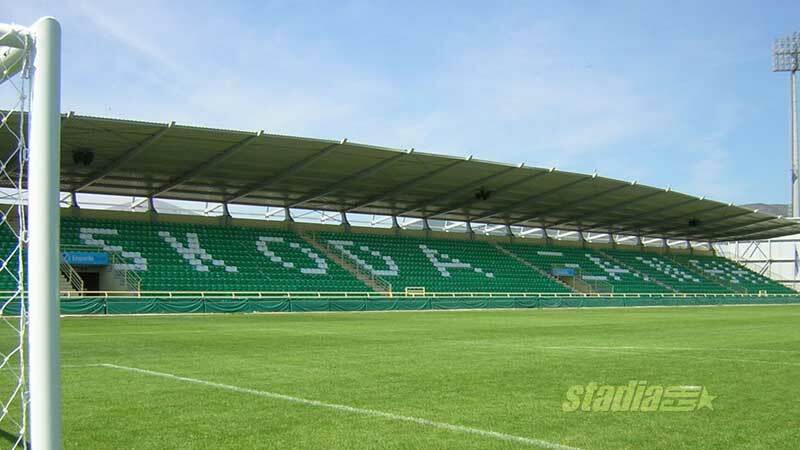 Skoda Xanthi Arena has hosted the likes of Middlesbrough, Dinamo Bucureşti, and Standard Liège in qualifiers over the years, but are yet to progress to the group stages. As for the future of the ground, it’s unlikely that any major renovations will occur in the future. Two out of three of the stands feature a roof, and thus Skoda Xanthi may look to add one to the northern-stand however it’s hardly a pressing issue. 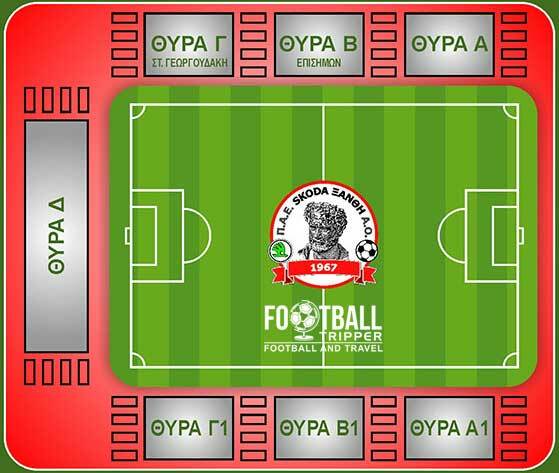 Skoda Xanthi Arena is comprised of four stands: North, East, South and West. Away fans appear to be housed one end of the west stand, if any Greek Football Trippers know where exactly then please get in touch! The fan shop at the stadium is located within the west stand and is usually open for business on matchdays. Attending a match seems like the best and possibly only way to purchase merchandise of Skoda Xanthi F.C as the club don’t appear to have an online store. No tours are available of Skoda Xanthi Arena and it’s very unlikely that this will ever change even if the stadium does become four sided in the future. Tickets are priced at a flat rate of €15.00 regardless of whereabouts you sit inside the stadium. Depending on the match you can sometimes purchase tickets from the official website however most fans tend to purchase tickets at the stadium on match days just before-kick off. Skoda Xanthi Arena is located just outside the small village of Pigadia approximately 7.6 km south-east of the actual city of Xanthi where the team originally hailed from. As the journey by foot is likely to take most Football Trippers the length of the match itself, walking is definitely not advised. There is a medium sized car park south of the stadium which reportedly has enough room for 1,000 vehicles on matchdays. Xanthi has its own railway station which is known as “Sidirodromikos Stathmos Xanthis” however it’s back within the city and certainly not within walking distance of the arena. The car park located around the perimeter of the stadium, and mountainous view. The closest major airport to Xanthi is Kavala International Airport which sits just under 40km south-west of the city along the M2 overlooking the sumptuous coast. Less than five minutes north-east of the ground along the main road there is Le Chalet Hotel which is in an unbeatable location but as the villages only place to stay, certainly a beatable price. Back within the city of Xanthi there are at least another half a dozen options to choose from including Motel Natassa, Hotel Xanthippion and Elisso Xenia Hotel.